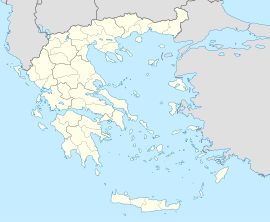 Evinochori (Greek: Ευηνοχώρι) is a village and a community in the southern part of Aetolia-Acarnania, Greece. Evinochori is in the municipality of Missolonghi, located 10 km east of Missolonghi town centre. It is situated on the right bank of the river Evinos, about 10 km north of its outflow into the Ionian Sea. The population in 2011 was 1,651 for the village and 1,664 for the community, which includes the village Nea Kalydona. Near Evinochori are the ruins of ancient Calydon, one of the most famous ancient cities in Acarnania. The Greek National Road 5 (Antirrio - Agrinio - Ioannina) passes through the northern part of the village. Motorway 5/E55, which opened in 2017, passes north of the village. The settlement was once known as Bochori (Μποχώρι),[when?] it was also mentioned as Bochor or Bohor in several maps, including that from 1668 by Turkish traveller Evliya Çelebi. It was an important centre where wine and grapes were produced. Part of the municipality of Missolonghi since Greek independence, Evinochori became an independent community in 1912. In 1997, it joined the municipality of Missolonghi again under the Kapodistrias reform. ^ "ΕΕΤΑΑ local government changes" (in Greek). Retrieved 2018-07-29. This page was last edited on 13 December 2018, at 20:44 (UTC).